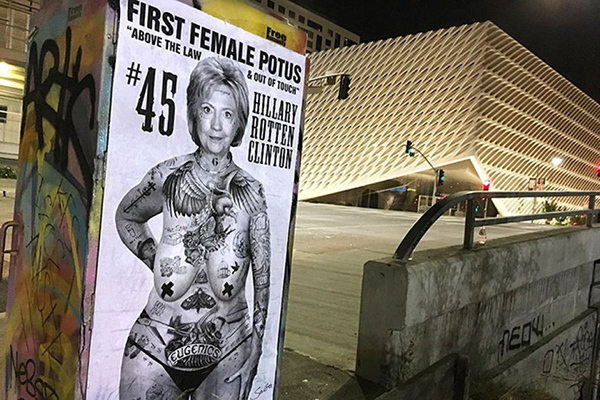 If you've never heard of Sabo, the right-wing street artist, you're probably a cloistered liberal, safe inside your bubble, listening only to liberal sources of news and information. If you're liberal and you have heard of Sabo, then more power to you. Sabo's modus operandi tends to involve huge images Photoshopped together to produce new, unflattering, and nastily satirical pastiches; he's been hounding the left for years in this way, pointing out perceived hypocrisy. But if you do know of Sabo, then you know that, up to now, he's been very guarded—like Banksy—about what he looks like, where he lives, and all the rest. Yet for some nutty reason, the guerrilla artist has suddenly thrown open the doors and allowed himself to be both interviewed and photographed. This article in the Weekly Standard doesn't give out Sabo's address, but I think there's enough tantalizing evidence there for an enterprising detective-wannabe to suss out where Sabo lives. It's an enormous risk on Sabo's part, but I guess it's consistent with his general ballsiness. Still, I fear for the future. The second photo in the article makes Sabo look disturbingly like Dr. Vallicella.